The winner is Michele Renee! Two turtle doves hours of SpongeBob! 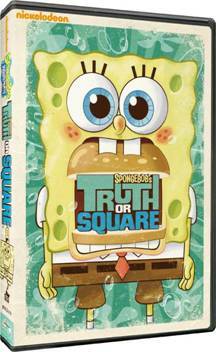 Nickelodeon presents SpongeBob SquarePants: Truth or Square on DVD! The DVD features the Special Extended Director’s Cut of the “Truth or Square” TV Movie with celebrity appearances. It also includes the behind-the-scenes of the SpongeBob opening and karaoke music videos! To be entered you must: Twitter, Facebook, and link to this giveaway and THEN tell me why you want this DVD and THEN promise me your firstborn for 20 extra entries!!! Hey Sarah, What a great idea for the holiday season!! I love being entered to win things so count me in again!! Spongebob is a favorite in our household. Count me in! I love spongebob. Great giveaway! I can't wait to see all the fun giveaways you have planned this month! Enter me for this one, please! We are such a Sponge Bob house. My boys would love more Sponge Bob. Your middle's BFF wants this movie!!!! I'll even take middle for the afternoon to view with his BFF!! He-he! How about I give you my last born? Please? god, i hate the fact that i know that song by heart. great...now i'll be humming it all day. I'll watch all three of yours for you!!! Seriously, my three are easier when there are even more boys in the house. SpongeBob is a religion at my house. Or a teacher--my Youngest asks me all the time what certain vocab words mean and I ask him where he heard that big word and he says on SpongeBob. My son would LOVE this. Please enter me! My nephews love Sponge Bob! Hope I win! I tivo'd this for my daughter and I know every word. Why not have it on DVD so I can watch it forever? Yeah, I succumb to the realm of the Sponge from time to time. Do you know how much I would ROCK if I had this???? Thanks for the opportunity! YaY! Please count me in, this dvd is on my kiddos Christmas list. I would love to win it and have one more present marked off. Thanks for the chance to enter my name. Just found your blog today! Glad I did too! This DVD is on my son's Christmas list! This movie would be so fun to own. my son is a spongebob addict and would love to win. thanks! While I am so NOT a sponge-ponge fan, my daughter totally is! My boys are big fans of the yellow guy.